Cleveland Clinic researchers have successfully used positron emission tomography (PET) imaging to visualize biochemical changes within mouse prostate tumors that indicate advancement of disease. The proof-of-concept study, published in the Journal of Biological Chemistry, establishes the feasibility of using noninvasive PET to predict which prostate tumors are likely to resist standard androgen deprivation treatments. Findings from the study, which was led by Nima Sharifi, MD, of the Lerner Research Institute, were two-fold. Dr. Sharifi’s team, including first author Ziqi Zhu, PhD, first discovered a metabolic “switch” that occurs when prostate cancer cells transition from being sensitive to androgen deprivation to being resistant to the treatment. In the new study, Dr. Sharifi found a previously undiscovered step in the pathway to castration-resistant prostate cancer (CRPC). 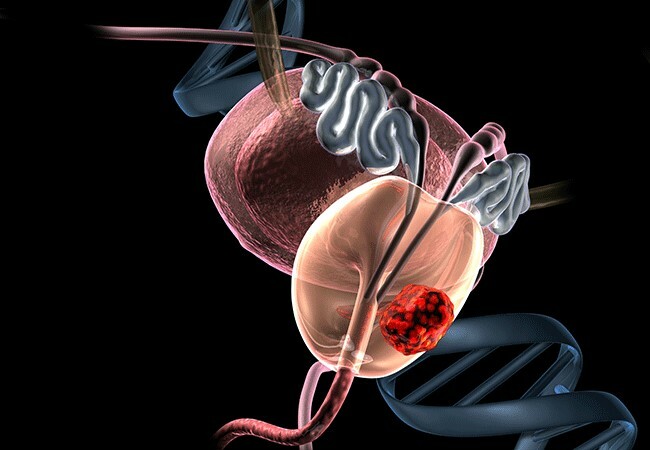 In typical prostate cancer cells, the amount of tumor androgens is kept under control. Specifically, the enzymes UGT2B15 and UGT2B17 bind to the androgen dihydrotestosterone (DHT), rendering it unavailable for use by the tumor and keeping androgen receptors in an inactive state. However, Dr. Sharifi’s team showed that in CPRC, this DHT coupling is absent, allowing free DHT to accumulate and activate androgen receptors. This change is a key step in the road to treatment resistance. After making this discovery, Dr. Sharifi’s team hypothesized that they could differentiate between coupled and free DHT using PET, which could help distinguish between treatment sensitive and treatment resistant tumors. They radiolabeled tumors that had either intact or deficient (knockout) UGT2B15 and UGT2B17 activity. The tumors with intact machinery had both coupled and circulating DHT, which was evidenced by high uptake of the 18[F]-DHT radiolabel and resulting bright PET signal. The knockout tumors showed a much weaker signal. These findings suggest a noninvasive method of monitoring the metabolic status of prostate tumors in real time and have clear implications for the future of prostate cancer imaging. “Today, PET imaging is only used clinically to locate and measure the size of prostate tumors,” Dr. Sharifi said. “We hope to use PET to monitor what is happening inside the tumor as well so we can better predict outcomes and tailor treatments.” Functional imaging to identify impending castration resistance would enable physicians to potentially change treatment course and avert full-blown resistance. This study was performed in collaboration with nuclear medicine specialists in Cleveland Clinic’s Imaging Institute and imaging specialists from Case Western Reserve University’s Department of Biomedical Engineering. Dr. Sharifi holds the Kendrick Family Chair for Prostate Cancer Research at Cleveland Clinic. He directs the Cleveland Clinic Center for Genitourinary Malignancies Research and co-directs the Cleveland Clinic Center for Excellence in Prostate Cancer Research. He has joint appointments in the Glickman Urological and Kidney Institute and Taussig Cancer Institute. In 2017, he received the national Top Ten Clinical Achievement Award from the Clinical Research Forum for earlier discoveries linking genetic variants with poor prostate cancer outcomes. This project was supported by grants from the Howard Hughes Medical Institute, Prostate Cancer Foundation, and National Cancer Institute (part of the National Institutes of Health).